Explanation: Better known as Hind's Crimson Star, R Leporis is a rare star in planet Earth's night sky. It's also a shocking shade of red. The star's discoverer, 19th century English astronomer John Russell Hind, reported that it appeared in a telescope "... like a drop of blood on a black field." Located 1,360 light-years away in the constellation Lepus the star is a Mira-type variable, changing its brightness over a period of about 14 months. R Leporis is now recognized as a carbon star, a very cool and highly evolved red giant with an extreme abundance of carbon. Extra carbon in carbon stars is created by helium fusion near the dying stellar core and dredged up into the stars' outer layers. The dredge-up results in an overabundance of simple carbon molecules, like CO, CH, CN, and C2. While it's true that cool stars radiate most of their energy in red and infrared light, the carbon molecules strongly absorb what little blue light is left and give carbon stars an exceptionally deep red color. R Leporis is losing its carbon-rich atmosphere into the surrounding interstellar material through a strong stellar wind though, and could be near the transition to a planetary nebula. Oh, and Happy Halloween from the folks at APOD. If we assume that the atmosphere would be similar to the Earth's atmosphere, the sky would be quite dark. The Earth's atmosphere preferentially scatters blue light, but a star like R Leporis produces little if any blue light at all. The red light from a star like R Leporis would not be efficiently scattered in the Earth's atmosphere at all. The inhabitants on a planet with an Earth-like atmosphere orbiting R Leporis would see a red star, surrounded by a reddish halo, darkening into blackness some distance from the star. Of course, if the star shone very brightly on this planet, it is of course possible that the entire sky would be rather darkly reddish or orange. Similarly, there are very many blue or bluish reflection nebulas in space, scattering blue light. 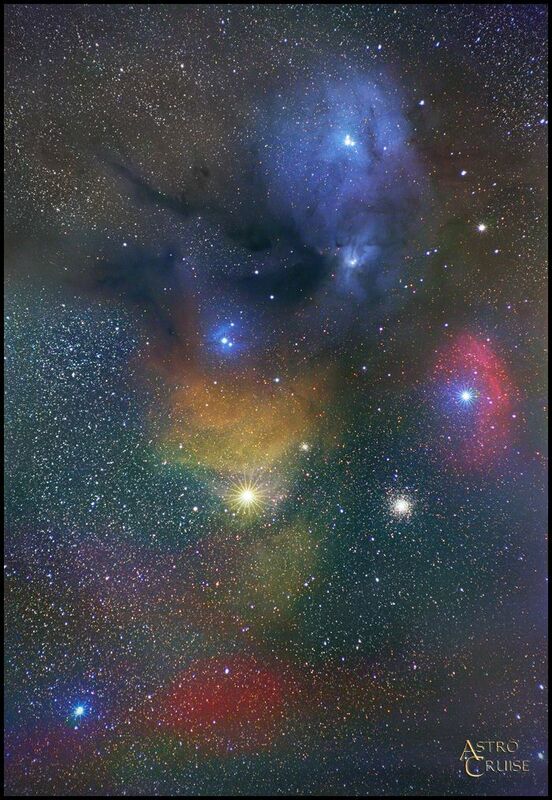 But there are precious few yellow reflection nebulas scattering red or yellow light in space, and the only such nebula I can think of offhand is the Antares yellow reflection nebula. Oh, P.S., and as Chris would probably point out: If humanity had evolved on a planet bathed in the red light of R Leporis, our eyes would have evolved so that they saw the red light of the star (and the sky) as "white" or neutral. A typical blue (blue sky) reflection nebula. blue reflection nebulas and red emission nebulas. My favorite star; thanks for the pic! 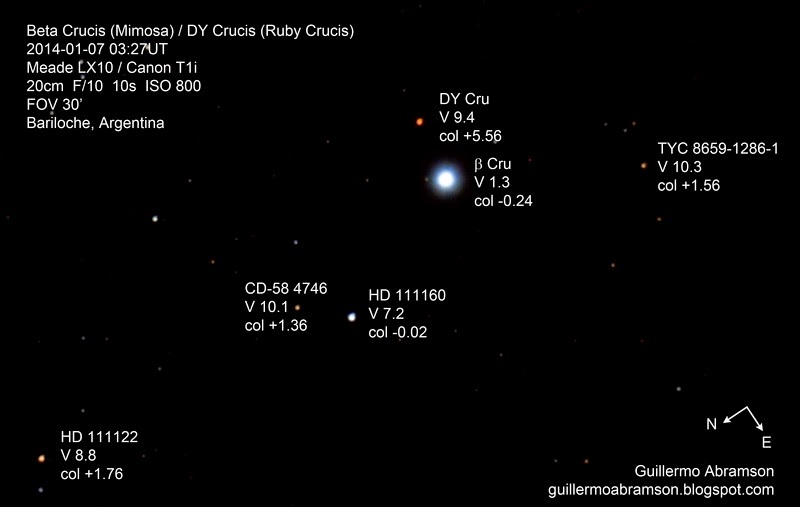 The carbon star DY Crucis is interesting to observe in contrast to the adjacent 1st magnitude Beta Crucis (Mimosa). The two are separated by only a bit over two arc minutes. There is a big difference in brightness but that seems to enhance the deep red colour of DY Crucis. Yay an unexpected APOD today! Can't wait to see what it is tomorrow! Ah, "helium fusion". Gota love the triple alpha process. No carbon (nor any heavier elements either, pretty much) without it. Ah, "helium fusion". Gota love the triple alpha process. No carbon (nor any heavier elements either, pretty much) without it. We exist "according to Hoyle"
Nice, but without the extreme instablity of Beryllium-8, the tripple-alpha process would proceed much too fast. 8Be has a very short half-life of about 7×10−17 s that contributes to its significant cosmological role, as elements heavier than beryllium could not have been produced by nuclear fusion in the Big Bang. This is due to the lack of sufficient time during the Big Bang's nucleosynthesis phase to produce carbon by the fusion of 4He nuclei and the very low concentrations of available beryllium-8. The British astronomer Sir Fred Hoyle first showed that the energy levels of 8Be and 12C allow carbon production by the so-called triple-alpha process in helium-fueled stars where more nucleosynthesis time is available. This process allows carbon to be produced in stars, but not in the Big Bang. Star-created carbon (the basis of carbon-based life) is thus a component in the elements in the gas and dust ejected by AGB stars and supernovae (see also Big Bang nucleosynthesis), as well as the creation of all other elements with atomic numbers larger than that of carbon. The attempt to tie carbon into real vampire juice gets the blood running. Fascinating. DY Crucis is really incredibly red, as far as I can tell from what my software informs me. The juxtaposition of Beta Crucis and DY Crucis should really enhance the deep red color of DY Cru, but it seems to me that it should also help bring out the blue color of Beta Crucis. 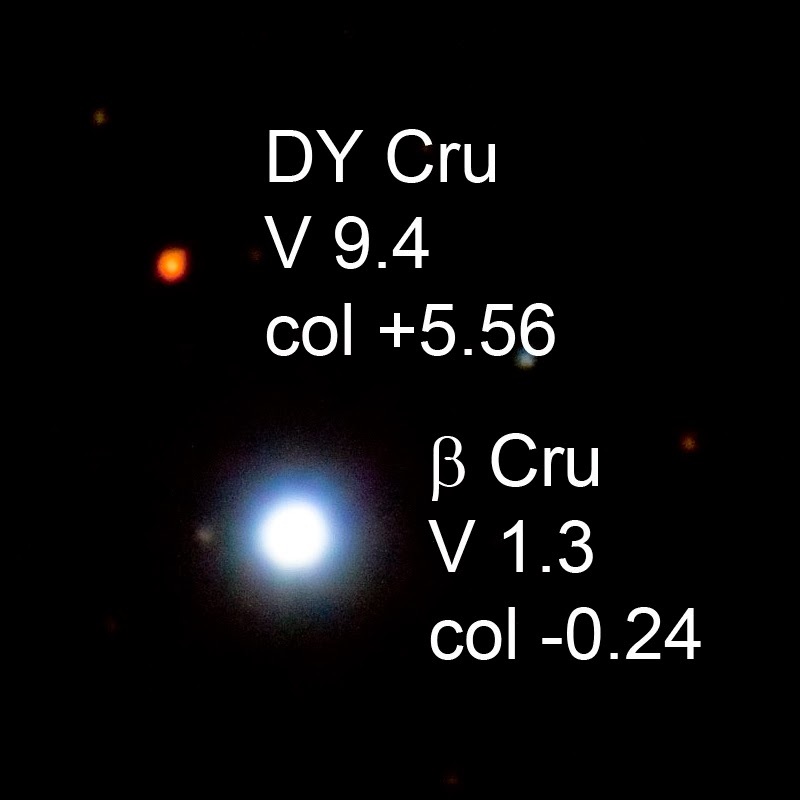 Beta Cru is really quite blue, with one of the most negative B-V indexes in the sky, at least among the bright stars. <<Mimosa is a genus of about 400 species of herbs and shrubs, in the mimosoid clade of the legume family Fabaceae. The generic name is derived from the Greek word μιμος (mimos), an "actor" or "mime," and the feminine suffix –osa, "resembling", suggesting its 'sensitive leaves' which seem to 'mimic conscious life'. Members of this genus are among the few plants capable of rapid movement; examples outside of Mimosa include the telegraph plant, Aldrovanda, some species of Drosera and the famous venus flytrap. The leaves of the Mimosa pudica close quickly when touched. Some mimosas raise their leaves in the day and lower them at night, and experiments done by Jacques d'Ortous de Mairan on mimosas in 1729 provided the first evidence of biological clocks. Note that, botanically, what appears to be a single globular flower is actually a cluster of many individual ones. Mimosa contains some level of heptanoic acid [an oily liquid that contributes to the odor of some rancid oils.]. Ahhhhh.... a star that stirs my vampire's blood....anyone want to come over for a quick bite??? Blue Mimosa (Beta Crucis) and DY Crucis. 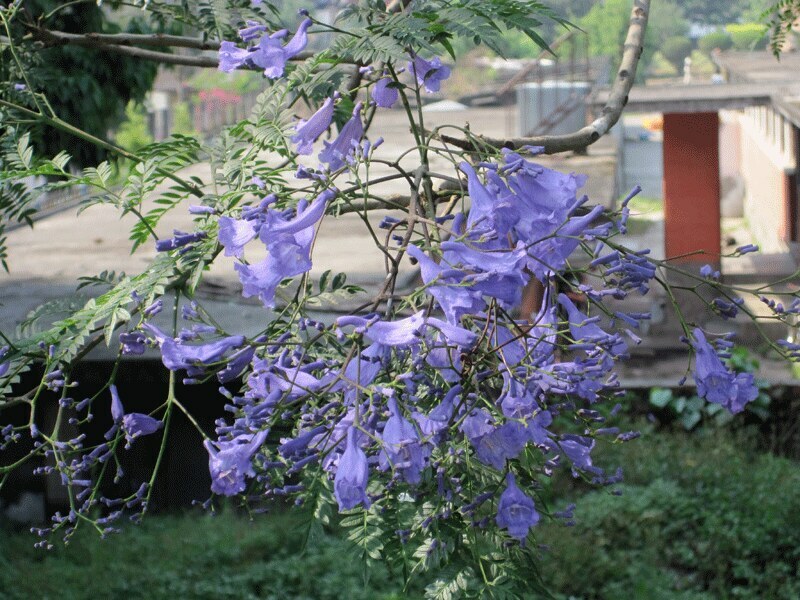 Blue Mimosa (Jacaranda). Photo: Jotare Dhaiba.